Gerbi CMS enable you to create and administrate hierarchical pages in a simple and powerful way. Gerbi CMS is based around a placeholders concept. A placeholder is a template tag that you can use in your page’s templates. Every time you add a placeholder in your template a field dynamically appears in the page admin. 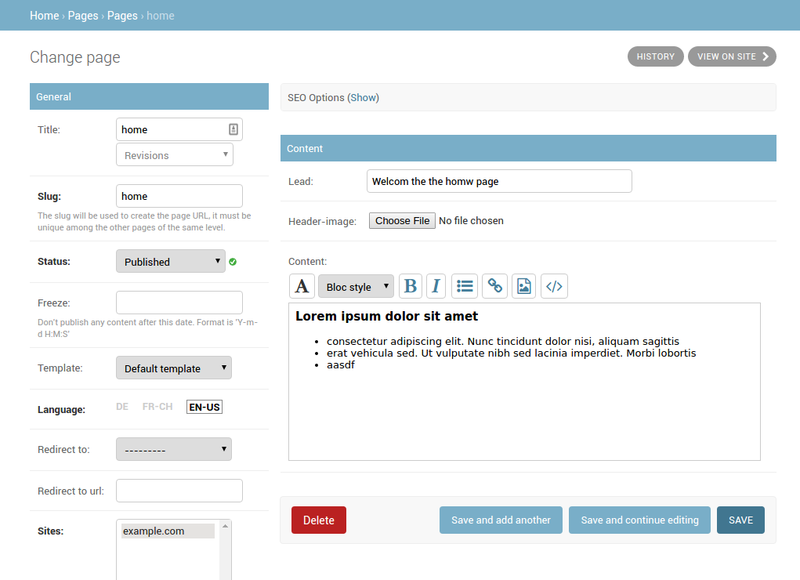 Automatic creation of localized placeholders (content area) in admin by adding placeholders tags into page templates. Search indexation with Django haystack. Advanced rights management (publisher, language manager). Rich Text Editors are directly available. Page can be moved in the tree in a visual way (drag & drop + simple click). The tree can be expanded/collapsed. A cookie remember your preferences. Possibility to specify a different page URL for each language. Directory-like page hierarchy (page can have the same name if they are not in the same directory). Every page can have multiple alias URLs. It’s especially useful to migrate websites. Possibility to integrate 3th party apps. Support for future publication start/end date. Page redirection to another page or arbirtrary URLs. Gerbi CMS is shipped with jQuery. Compatible with MySQL, PostgreSQL, SQLite3, some issues are known with Oracle. This application is available in English, German, French, Spanish, Danish, Russian and Hebrew.